New Zealand remained untouched by humans until around the 11th Century, when Polynesian travellers chanced upon its remote and pristine islands. Europeans began colonising as commercial settlers in the early 1800s. But it was not until the signing of the Treaty of Waitangi in 1840 that New Zealand became a nation in a modern sense. The Treaty was signed between the British Crown and the Iwi, the tribes of New Zealand’s indigenous people, the Māori. Surprisingly short for a national founding document – the English version is just 550 words – the Treaty guarantees Māori particular rights and protections under British law. The Treaty was promptly stored away as colonisation rolled relentlessly on. Symbolically, when retrieved in 1908 the Treaty document was ‘in damaged condition presumably rat eaten’. It was not until the 1970s that New Zealand governments began to honour the spirit of the treaty proper, impelled by land rights protests and a ‘Māori renaissance’. Today the Treaty is popularly seen as the nation’s founding document, and serves as a quasi-legal document against which tribal compensation claims are considered. The Treaty is also symbolic of a biculturalism that pervades New Zealand society and government. The contemporary northern Māori name for the land – Aotearoa, the ‘land of the long white cloud’ – is becoming as common as New Zealand, the formal name bestowed on it by Dutch explorer Abel Tasman. It is now customary to sing the national anthem in a mix of Māori and English. The Māori language, Te Reo, is colonising officialdom, most obviously in the bilingual names of government departments. Public policies actively promote Te Reo. Biculturalism is also evident in New Zealand’s cultural policies. The New Zealand framework for cultural statistics includes a section – Taonga Tuku Iho – dedicated to distinctly Māori culture. In 2009, more than 17 percent of national government cultural expenditure was dedicated to Māori culture. New Zealand’s cultural diversity policies overlay this fundamental bicultural platform. In 1840, when the Treaty was signed, New Zealand cultural policy was in its infancy, regionally based and centred on cultural heritage institutions and libraries. As government grew, so did its cultural interventions. (See the Ministry for Culture and Heritage’s excellent cultural policy history of these early years) But it was not until the 1960s that the modern era of New Zealand cultural policy began. In 1963 the Queen Elizabeth II Arts Council, now Creative New Zealand, was established. As with other British colonies, the arts council was built on a strong arm’s length ethos ‘to protect the arts from political interference and to insulate governments from the ill will arising from unpopular funding decisions.’ (Ministry for Culture and Heritage 1998, page 3). The arm’s length principle was later extended to film and broadcasting policy, with the creation of the New Zealand Film Commission in 1978, and the Broadcasting Commission (now NZ On Air) in 1989. Initially limited in size and focus, the Ministry has since grown substantially to include broadcasting and sport. The Ministry undertakes a range of advisory, leadership, administrative and delivery functions. It leads the government’s Cultural Diplomacy International Programme, one of a range of exchange programs described on its website and at Creative New Zealand’s website. Government investment in culture has increased substantially since the creation of the Ministry. 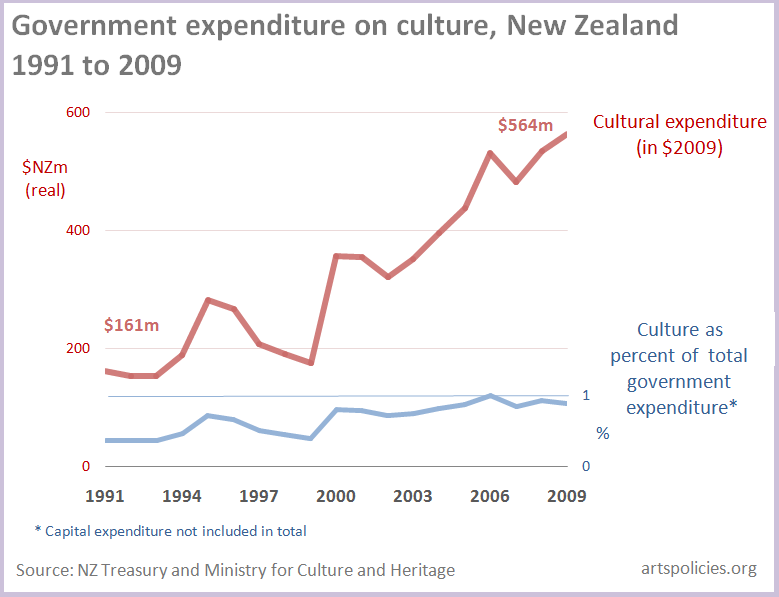 The figure below shows national government expenditure on culture from 1991 to 2009. The top line is expenditure on culture and heritage (expressed in ‘real’ 2009 dollars). The lower line, drawn to the right-hand scale, shows culture as a percentage of total government expenditure.1 The rise in this line shows that cultural expenditure increasing more than total government expenditure over the period. The ‘bump’ in expenditure from 1995 to 1996 represents capital funding to build the national museum. But in 2000 a more enduring increase is evident. This is the result of a ‘cultural recovery package’ launched by Prime Minister Helen Clarke, who was also Minister of Culture at the time. Michael Volkerling describes and analyses the watershed recovery package, but argues that the package was just one of Clark’s cultural legacies; others being her promotion of New Zealand’s military heritage, her successful adaptation of the UK ‘creative industries’ policy framework, her extension of intellectual property protection in response to digital innovation, and her increased investment in film. The Clark government was interested in culture’s impacts on employment, tourism and national identity. Between 2004 and 2009 its policy mix saw increases in expenditure on film, broadcasting, the national library, Māori culture, and regional museums. There are two other key players in New Zealand cultural policy besides national government: local governments and the national lottery. New Zealand’s regional governments and local authorities support a range of cultural activities, but are especially active in supporting public libraries, museums, art galleries and cultural venues. Data on the cultural expenditures of these governments is difficult to obtain. 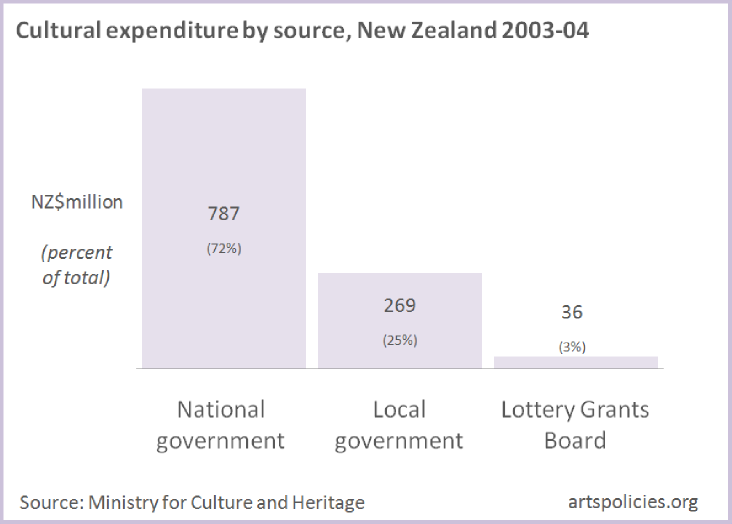 In 2004, the most recent year for which data exist, local governments spent just over $NZ269 million on culture. Although lotteries have long been used in New Zealand to support culture, it was not until the 1960s that lottery funding matured with a popular new lottery and an arm’s length system for distributing lottery proceeds. Funds available rose substantially again in the 1980s with the introduction of the current national ‘Lotto’ game. Again, up-to-date cultural funding data are not readily available, but data for previous years suggest the Lottery Grants Board distributes around 40 percent of its grant funds to culture. The figure above shows cultural expenditure by institution for 2004. National government made up nearly three quarters of cultural expenditure, local governments one quarter and the Lottery Grants Board three percent. This should not be interpreted as Lottery Grants Board funding being insignificant. In 2010, Creative New Zealand’s Lottery Grants Board funding was three times higher than national government funding. In the same year the New Zealand Film Commission received almost as much from Lottery Grants Board as it did from government. Christopher Madden is a cultural policy research analyst and statistician. He has worked for a range of cultural policy agencies across Australasia. From 2001 to 2008 he was Research Analyst at the International Federation of Arts Councils and Culture Agencies. Christopher’s research can be viewed at his website artspolicies.org. Cultural Sector: a survey of the issues. Volkerling, M., 2010, The Helen Clark Years: Cultural Policy in New Zealand 1999-2008, The Journal of Arts Management, Law, and Society, Volume 40, Issue 2, 2010. Ministry for Culture and Heritage, 2011, General directions of cultural policy, from Cultural Policy in New Zealand. Cultural Policy in New Zealand: The Helen Clark Years, The Journal of Arts Management, Law, and Society Volume 40, Issue 2, 2010. Ministry for Culture and Heritage,2011, Cultural Policy in New Zealand. Special Australasian edition, part 1: measurement, Cultural Trends, vol 19(4), 2010. Special Australasian edition, part 2: issues in cultural policy, Cultural Trends, vol 20(1), 2011. Volkerling, M., 1996, ‘Deconstructing the Difference-Engine: A Theory of Cultural Policy’, International Journal of Cultural Policy, vol. 2(2), 189-212.
vol 7(3), 437 – 455. A Clever Little Country? Cultural change and identity in New Zealand, Media International Australia, no 117, November 2005. Linda Moss, L., 2005, Biculturalism and cultural diversity, International Journal of Cultural Policy, vol 11(2), 187 – 197.